A new affordable housing project in Calgary’s Temple community means more than 120 seniors with low income will have a safe and affordable home. 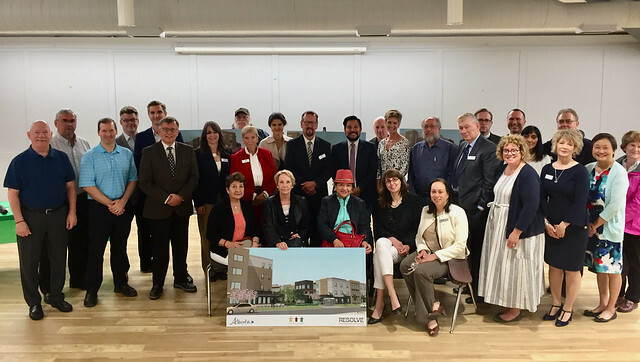 Minister Ricardo Miranda, representatives from Trinity Place Foundation and residents of the Temple community in Calgary celebrated the government's $20-million contribution towards a new 120-unit affordable housing project. The Government of Alberta is investing $20 million to provide 70 supportive housing units for people aged 55 and older who have trouble finding traditional housing and 50 apartments for seniors with low income. This project was a community effort. It will be built on the former St. George’s Anglican Church site. The new housing facility will be operated by Trinity Place Foundation of Alberta, and will specifically serve low-income seniors and those who have found it hard to find housing. The total budget for this project is $35 million. The Alberta government’s $20-million contribution is part of the $1.2-billion commitment in the Provincial Affordable Housing Strategy to develop a sustainable affordable housing system. The RESOLVE campaign will contribute $4.7 million to the Templemont project. Trinity Place Foundation is contributing $2 million in equity.